Zwift connects to your sensors (smart trainer, power meter, heart rate monitor, cadence, speed) wirelessly using either Bluetooth or ANT+. One frustration we see pop up on Zwift message boards repeatedly is ANT+ dropouts: those frustrating events when Zwift stops receiving data from your sensors. What are the typical causes of these dropouts, and how can you avoid them? This is by far the most common issue causing ANT+ drops, and it’s due to the inherent weaknesses of ANT+ as a wireless protocol. Fortunately, if your problem is weak signal or interference it is usually fixed quite easily. Here are common causes and solutions. If your ANT+ dongle is more than a few feet away from your bottom bracket, it’s possible the signal from your sensor(s) is not reaching the dongle. Fortunately this, is easy to fix! Simply buy a USB extension cable ( here is one we recommend from Amazon) then install it with one end plugged into your computer and one end into the ANT+ dongle. Now you can locate the dongle wherever you’d like. If you need a cable more than about 3 meters in length you should purchase an active USB extension cable to ensure a strong signal. Here is one which comes highly recommend on Amazon.. Most people set up their wifi routers with default settings, which means the router chooses which channel to use when it boots up. If your router uses 2.4Ghz (which most do) chooses any channel from 9-12 it could very well cause interference with ANT+. The image below shows the spectrums used by each router channel, with ANT+ labeled in blue. Logging into your router and forcing it to use a particular channel far away from the ANT+ signal will ensure wifi interference is not an issue. Other devices operating nearby may cause interference leading to dropouts. I’ve heard of more than one Zwifter who only experienced dropouts when their spouse was using the microwave! Fans are another common cause, but any electrical device has the potential to interfere with your ANT+ signals, so if you are experiencing issues you may need to just unplug items one at a time to see what solves the problem. This includes other wireless devices (such as a mouse or keyboard) on your computer. If you are plugging your ANT+ dongle straight into your computer, using a USB extension cable to get it away from the computer’s electronics is a good idea. While smart trainers are plugged in for power, everything else (including your power meter) uses batteries. As these batteries weaken, the signal strength is reduced. 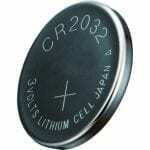 Installing fresh batteries may just solve your problem, which is why I always keep a pile of 2032 batteries on hand. Buying these in bulk from Amazon is much cheaper than paying a few bucks apiece at your local store. Only one program on your computer can “own” your ANT+ dongle at any given time, so make sure you aren’t running any programs that use ANT+ dongles. The most common culprit here is Garmin’s software, “Garmin Express”. USB version: make sure your ports are version 2.0 or higher, as USB version 1 will not work with Zwift. If possible use a USB 3.0 port. 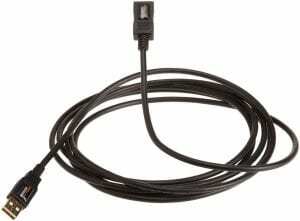 Adequate power: some computers only send 100mA of current to certain USB ports, and you need at least 500mA. Purchasing a powered USB hub or switching to a higher-powered port on the computer can fix this. I recommend this Sabrent 4-port hub, but any powered USB hub will do! If you’re dripping sweat, water, etc on your USB dongle then it will stop working sooner or later. Simple solution: put the dongle into a small plastic bag so it is sheltered from sweat. 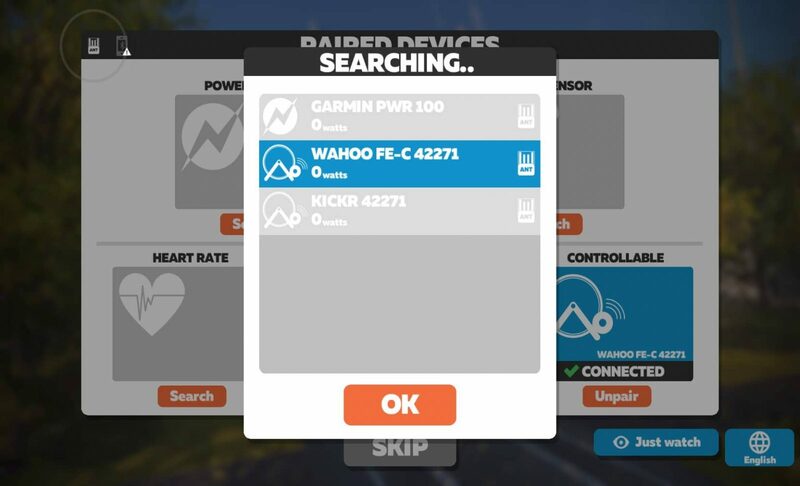 I’ve seen more than a few Zwifters who have had ANT+ dropout problems with their KICKR smart trainers because they paired the wrong profile in the “Power Source” and “Controllable” windows of the pairing screen. If you’re having KICKR power dropouts, pair the profile that has “FE-C” in the name. (The other profile does not use FE-C, and seems to have some problems. Word is Zwift may be removing it from the game in the future.) Note: this fix may apply to other trainer models as well. Have you had ANT+ dropouts that you fixed? Share your solutions below! My Cycleops Hammer had frequent dropouts that were eventually resolved by a mechanic at my LBS using a small screw driver to split and expand the hollow pin inside the power plug on the unit. 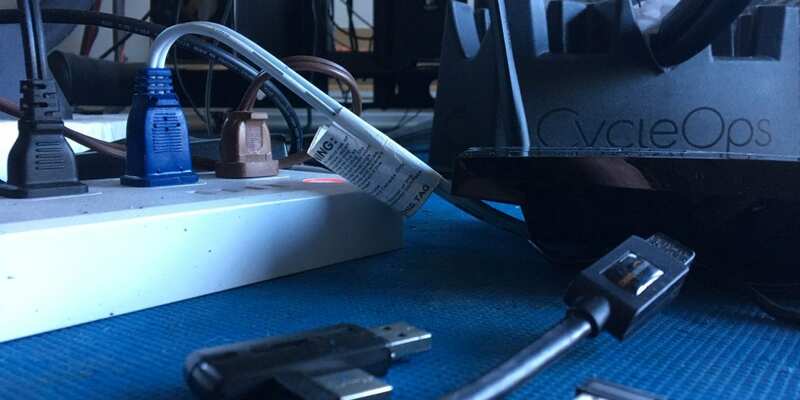 Apparently, the pin can be become compressed causing loss of power which can drop the power signal to zero even though it appears to the user that the Hammer is remains connected to Zwift. Interesting one, Jae! Thanks for the comment. I can also confirm this with the hammer. I would get drops during hard sprints and climbs out the saddle. One day I looked back and noticed the LED flicker on and off. I used a small precision screw driver to widen the male lug on the trainer. It’s now been rock solid. Changing to “FE-C” for my KICKR 2016 solved my zwift dropouts. I never had a problem before on the “KICKR” option until a week or so ago, when the power dropouts started every 2-3 minutes, very frustrating. i have no dropouts on other apps (rouvy, virtugo) so i figured it had to be a zwift issue. Thanks for the tip!! Big thanks for the tip on changing to “FE-C”. I was experiencing frequent drops while performing a training program. The frequent prompts of “More Power” when I was suffering and maintaining the correct power were very frustrating. Switching to “FE-C” seems like it fixed the problem. This advice wasn’t on the Wahoo or Zwift support sites.